It’s been quite a long time (four and a half years in fact) since I looked at the state of the African language Wiktionaries. For those new to Wiktionary, the idea is that it will describe all words of all languages using definitions and descriptions in the particular language edition. An ambitious task! So, how are the projects progressing? In short, although it’s been so long since the last update, there’s not much to show. The only project to more than double its articles in four and a half years is Tsonga, off a minute base. Malagasy has always had a huge amount of bot activity, and is still growing from a large base, and Afrikaans shows some signs of life. 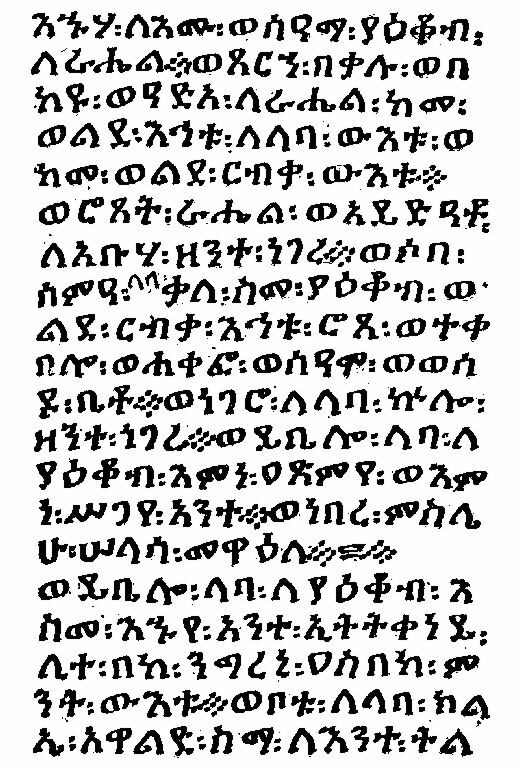 But overall, the state of the African language Wiktionaries can be described as dormant. Perhaps the African language Wikipedias will fare better? The Zulu Wikipedia is the latest addition to the 1000 club, having reached this milestone just before Wikimania last year, and progress has been steady since then. At first glance, Hausa looks like it’s in great shape, with an 88% increase in the number of articles. But this is misleading, as many of these are one line articles on football players, the entirety of which translates as, for example, “Kenny Allen (footballer) is an English football player.” No disrespect to Kenny Allen, but I’m not sure he and the 100s of other footballers listed there are critical components of Hausa knowledge. There’s a move to delete these articles (you can see the impressive list here while it’s up), but even if they survive, it’s not a sign of a healthy project. Leaving aside Hausa, it’s once again Afrikaans, growing at an impressive 53% over the period, that provides an example for the rest. At current rates, it’s on track to pass Malagasy and reclaim its position on top in about a year or so. Besides Afrikaans, only Shona, Swahili, Somali and Zulu show a growth rate above 10%, while quite a few sit idle. Afrikaans remains the only project that could be described as a usable Wikipedia – the other languages are still very much in the formative stages. Zulu is also showing signs of life. Besides these two, only Xhosa and Swati see growth rates above 5%. It’s sad to see the stalling of Northern Sotho, while Ndebele shows no signs of getting out of the incubator anytime soon. 2019 has been proclaimed the Year of Indigenous Languages by the UN, but so far there’s not much sign of a change in the status of the African language projects. Later today sees the South African Centre for Digital Language Resources, in collaboration with the Academy of African Languages and Science from the University of South Africa, present an interactive day workshop on contributing to Wikipedia in South African languages. It’s great to see this initiative, which arose with no help that I’m aware of from Wikimedia South Africa. I’m always hopeful with events like these. Generally very few people to stay around to edit Wikipedia, but as projects like Northern Sotho and Swahili show, one person can make a huge difference in the early stages, and it justs needs a committed editor to stick around. It’s a lonely job editing in the early stages, wondering if it’s worthwhile, no community, no idea if their work is being read. Hopefully someone will take on the challenge! If you are looking to contribute, but don’t know where to start, please reach out to Wikimedia South Africa and we’d be happy to assist. 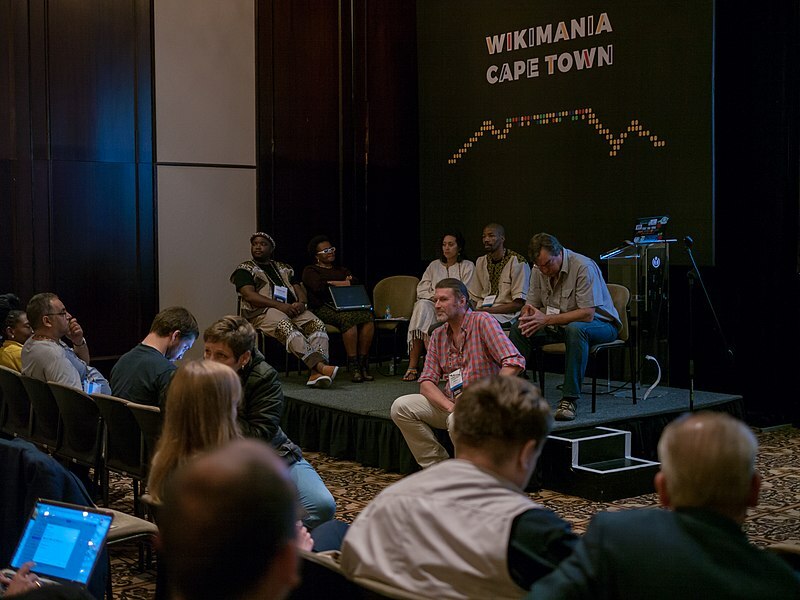 The 2018 Wikimania was held in Cape Town from July 18 to July 22. Wikimania is the annual conference of the Wikimedia Foundation, the foundation supporting Wikipedia and other hosted projects, such as Wikimedia Commons, WikiVoyage, Wikidata and Wiktionary. I’ve never been to a Wikimania before – the closest I came was almost going to Taipei in 2007, and leading the Cape Town bid in 2008, which I’m very grateful ended up second to Alexandria. It was the best conference I’ve attended, and according to a few anecdotes, the best Wikimania for some of the regular participants as well. It was hosted in the Cape Sun in the central city. The entire hotel was booked, with a second nearby hotel for some of the overflow, so most of the attendees were right there, and had easy access to various tourist activities. 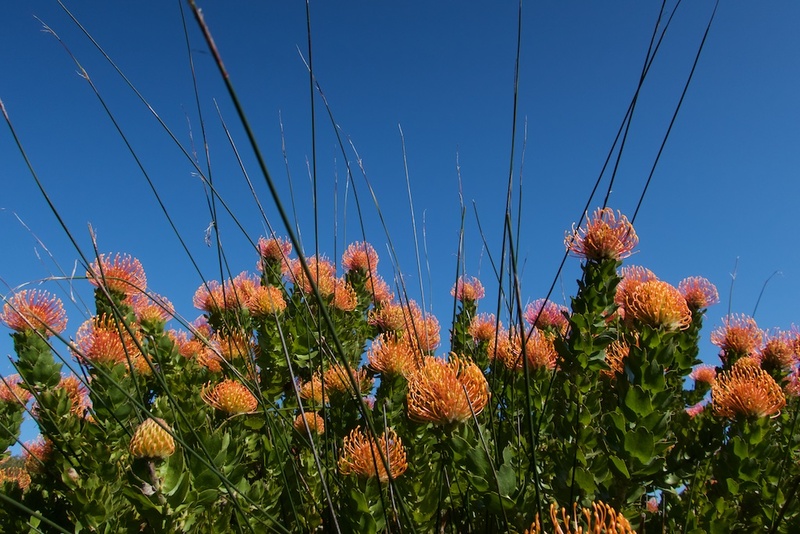 For some participants, it was their first visit to Cape Town, South Africa, or even Africa, and judging from the stream of photos on videos on some of the channels, people were enjoyed the experience of visiting a new place. The wifi was excellent, surpassing many other, even commercial, conferences I’ve attended before. Food was great, and the masterstroke of serving lunch from 10am to 4pm meant lunch fitted into everyone’s schedule. And yes, if you arrived at 4pm, there was still ample food. Another huge benefit was that, to my knowledge, everyone that wanted a visa got one. The last few Wikimanias have seen delegates, even on full scholarships, not able to attend after experiencing visa hassles. Last years Wikimania in Canada was particularly disastrous in this regard. The local organisers put effort into ensuring visa applications proceeeded smoothly, and of course South Africa, being a poorer country, is far more welcoming of visitors than most previous hosts. There was some talk of making visa accessibility a priority criteria for upcoming Wikimanias, so we could see a number of new locations on the schedule in future. While attending in a location such as the USA is great for attracting lots of people already involved, the Wikimedia projects need to grow beyond their traditional strongholds. About a quarter (by my visual reckoning) of attendees were at their first Wikimania, so Wikimania Cape Town certainly helped reach a whole new audience. I didn’t want the conference to end. I was torn between attending multiple great sessions, meeting lots of new people, and the role I took on for the event, tweeting up a storm for the Wikimedia South Africa Twitter account, which felt like a fulltime job at times, with tweets pouring in from multiple sessions at once. Wikimedia South Africa also signed up lots of new members. I was happy I got time to make progress on helping integrate Wikidata into the Siswati and Xitsonga Wikipedias in particular (and if I can find people to work with for the other South African languages, will help there as well). Wikipedia has always been unstructured data, and Wikidata corrects that by structuring the data, making it much easier to use across projects. Before using Wikidata, updates had to be done on each individual Wikipedia language edition. For example, in mid-July, the latest South African population estimate was released. At the time of writing, Wikidata and the English Wikipedia have the updated figure, 57,725,600. The German Wikipedia has the figure from 2017, 56,521,900. The French Wikipedia states the figure from 2016, 55,653,654. The Sotho and Afrikaans Wikipedias give 54,956,900, the 2015 estimate. Xhosa and Northern Sotho go back to 2013, giving 52,981,991. Zulu goes even further back, to 2011, with the census figure of 50,586,757. Swati, thanks to Wikidata, gives the 2018 figure. It’s a huge boost for everyone, with content needing only to be updated in only one location, and filtering through to all language editions. Installing the templates require admin permissions. I am not an administrator on any Wikipedias, and some of the smaller South African language Wikipedias don’t have any admins at all, so installing them needs a helpful person with rights. Luckily it’s a once-off task, and Wikimania was a great place to find help – thanks to User:Theklan, from the Basque Wikipedia, for his assistance. Once the templates are translated, the results may need to be translated as well. Editing Wikipedia is supposed to be as simple as clicking the Edit button. It was in the early days, but now with nested templates within templates, or with templates pulling in data from an entirely different project, it’s not nearly so simple anymore. The English Wikipedia has built up a great deal of complexity, all with good reason (to remove needless repetition), but it can be difficult to make a change, even for experienced editors. Introducing Wikidata introduces similar complexity to smaller Wikipedias, where there can be little expertise to overcome obstacles. There is no simple link to click, so a user has to navigate to Wikidata, find the correct term themselves, and then navigate the slightly more difficult Wikidata interface, in order to edit a value. I don’t see this happening easily. The next downside is customisation, which is very limited. The format of the numbers, which fields are shown, which order, are all not possible or easy to customise. There’s no easy way to hide fields that are still in English, or fields that the language community decides are not necessary in their edition. Making things even more tricky are that there are different implementations of Wikidata templates. I attended a workshop demonstrating something I really needed, but the demonstrated solution was not available in the implementation I’m using. Still, overall using Wikidata is extremely positive for the Wikimedia projects, and hopefully with some attention to simplicity in actually making edits, they can live up to their potential. Thanks to everyone involved for making Wikimania Cape Town a great success, and leaving us inspired as we build a world in which every single human being can freely share in the sum of all knowledge. Wikimania 2008 in Cape Town? Just in time for Wikimania, the Zulu Wikipedia has reached the 1000 article milestone. Congratulations to user Njabulo19 who created the 1000th article. Njabulo19 started editing actively in 2017 and has continued into 2018, and has paid particular attention to article categories. 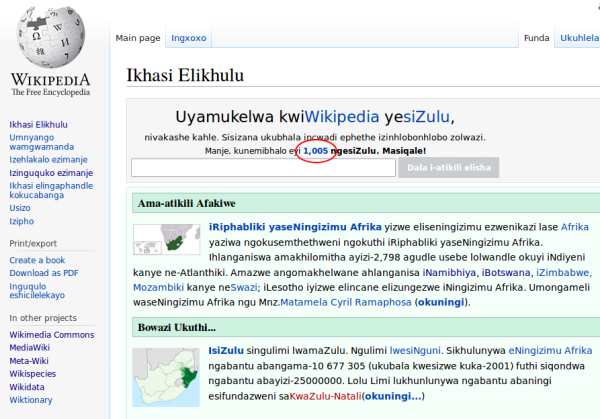 Well done Zulu Wikipedia community for having reached 4 figures – wishing you speedy progress to 5 figures! 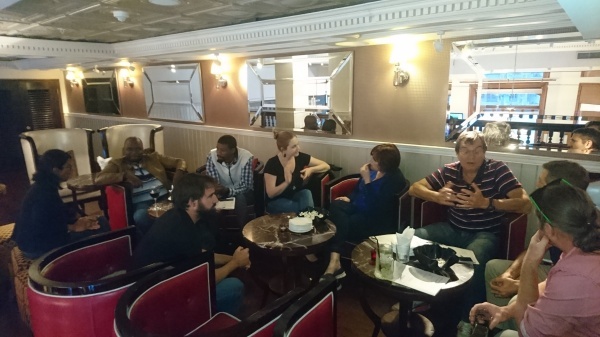 Cape Town was very lucky to host Wikimedia Foundation’s Senior Program Officer Asaf Bartov at the end of his Africa tour. 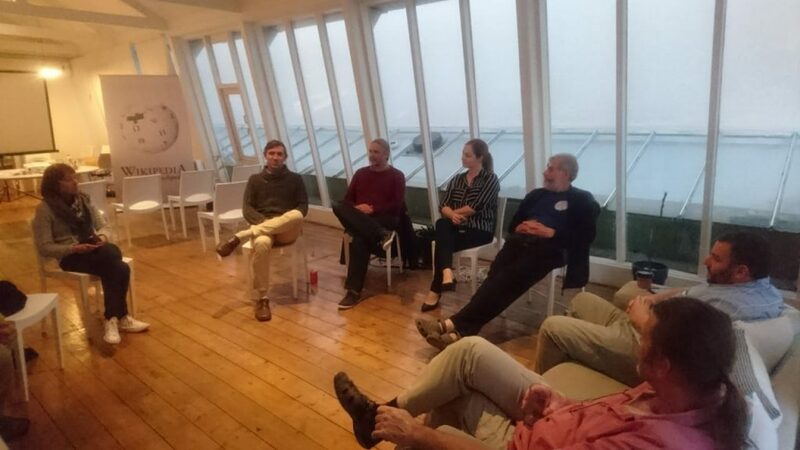 We held a meetup, and it proved particularly inspiring to those attending. Asaf spoke about Wikidata, discussed projects using the data, and demonstrated a number of tools that were new to most of us, such as https://query.wikidata.org, which uses the SPARQL query language to query Wikidata content. Wikidata adds structure to the content which makes pulling out all kinds of related information possible. Wikipedia data is fairly unstructured. Numerous categories exist, so if you’re looking for, say, a list of South African politicians, there’s both a list page and a category page. However, if you want something more detailed, such as a list of South African politicians that have a father that was a politician, without lots of manual slogging, Wikipedia alone won’t be much help. That’s where https://query.wikidata.org comes in, and once familiar with SPARQL, such questions are easy to answer. Even more exciting to me was Quarry. Years ago I remember toying with the idea of downloading a Wikipedia database dump, but at the time the massive download would probably have ground South Africa’s internet to a halt. Quarry is an interface for running SQL queries directly on the Wikimedia Foundation’s backend MariaDB databases. The bar to getting something useful is a little higher than on https://query.wikidata.org, as to use it effectively requires getting to know the data structure, but since access is direct, it’s a tremendously powerful tool to extract almost anything you want. I can already see myself diving in and automating and expanding the (semi) regular African language updates I do, or getting automatic notifications of activity in some of the small South African language Wikipedias. And if those listed above are not enough, Asaf has a tool section on his user page listing yet more wonderful tools you’ve probably never heard of. Thanks Asaf for taking the initiative to pay a visit to some of the African Wikimedia communities, and leaving a trail of inspiration in your wake. It’s time to look at the state of the African language Wikipedias again, as always based on the imperfect metric of number of articles. This is the 2nd update in a row that gets to welcome a new language to the thousand article mark – congratulations Kikuyu which has now joined the list, and is already hot on the tail of Igbo. I know some of the Afrikaans Wikipedia editors have been a bit disappointed by the slowing pace of growth as they move towards 50,000 articles. But, to put it in perspective, the 2013 Global Brittanica had about 40,000 articles, so there are less and less obvious gaps in content. Afrikaans is also one of the highest quality Wikipedias for its size – there’s a focus by many editors on the quality of articles rather than just the numbers. And they shouldn’t be too disappointed by the pace – Afrikaans is still the fastest growing African-language Wikipedia, catching up to Malagasy, which has the most articles. It’s interesting that Afrikaans is getting more media attention, but still has to deal with concerns such as but anyone can edit it, how can we trust it?, the kind of thing the English Wikipedia has long moved on from. A definite focus area for us as the Wikimedia South Africa chapter. Swahili continues to grow steadily, and Egyptian Arabic as well, and the other languages continue to grow slowly. Looking at the South African languages in particular, besides Afrikaans, Northern Sotho has returned to a more natural growth compared to the spurt of the previous period. User:Aliwal2012 continues to be the standout contributor there, having now created 3,228 pages. Growth in the Zulu Wikipedia has picked up slightly, with a few relatively new editors contributing the majority of recent additions. Two other languages have also seen an uptick. Tsonga has leapfrogged Swati, mainly thanks to User:Thuvack, who’s on track to make 2017 his record year for Tsonga contributions. Sotho has also passed Swati, with User:Aliwal2012 active there as well. So what are you waiting for? If you haven’t edited before, don’t be afraid that you’ll find the syntax difficult – be bold, and there’ll always be someone to ask for help. All it takes is clicking that “Edit” link and getting started. With just a few edits a week and you could be making a noticeable difference to one of the African language Wikipedias! The March update was positive, so let’s see how the various African-language Wikipedias have progressed since then. As always, this measures the number of articles, which is an imperfect metric, but it’s interesting to follow the trends. Afrikaans continues to grow the steadily, and recently celebrated its 15th birthday. The quality of articles is high, and it’s starting to get more media attention. Which also means dealing with the kind of responses that the English Wikipedia has moved on from, such as but anyone can edit it, how can we trust it. It’s good to see the solid Afrikaans community continuing their impressive work. Most of the languages have continued to grow as per their previous tends, but yet again Northern Sotho is an exception, and showed the fastet growth over this period. Why is it doing so well? The overused Margaret Mead quote Never doubt that a small group of thoughtful, committed people can change the world. Indeed, it is the only thing that ever has. perhaps? It’s disputed whether she actually said it, but moving on, just how small are we talking about? In the case of Northern Sotho, there are two main champions. User:Mohau, who has single-handedly created a whopping 4916 of them, and User:Aliwal2012, who I mentioned in the March update, has created 2958 articles. These two editors are an inspiration! Besides Afrikaans and Northern Sotho, none of the languages are showing substantial progress, but all are showing signs of life, except for Ndebele, which has stalled in the incubator. As South Africa’s smallest official language, it most reflects the struggles of many of South Africa’s languages, which while official on paper, receive little to no real support. But there’s no need to wait for others. Hopefully the Northern Sotho example has inspired you. All it takes is sitting down and editing! A while ago, I noticed a comment on the talk page of one of the Wikipedia editors that I follow. An article he had created was nominated for speedy deletion. Speedy deletion is the kind of thing reserved for articles about my pet cat, my high school teacher, the rock band I’ve started in my my basement that will be performing its first gig soon, the brilliant new open source content management system I wrote last night. In other words, articles that are uncontroversially deemed to be a waste of space. The editor, Bobby Shabangu, has created many articles, almost exclusively African content, on the English Wikipedia, as well as the Swati Wikipedia. He’s on the board of Wikimedia South Africa. So, unlikely to add an article about his rock band then. I took a look at the article. It was on David Tlale, a South African fashion designer. At the time (and it’s still the case as I write), the article was very short, a stub, but had a couple of good references. In no way was it worthy of nomination for speedy deletion. But it’s the kind of situation African editors routinely face. Whenever African content is added, the chances of it being nominated for deletion are high. In many cases, the editor is at fault, having not provided sufficient references, but in many cases it’s simply a case of systemic bias. Wikipedia recognises this (there’s a whole article on the issue, and how to tackle it), but that doesn’t help minimise the impact. At any gathering of African editors, there’s almost always much grumbling about the latest rejected content, a sharing of war stories. Another member of the South African board says he no longer contributes to the English Wikipedia for this very reason. And undoubtedly, if you’re able to contribute in another language, it’s far more rewarding to see your contributions gratefully accepted rather than viewed suspiciously. I started editing in 2002/2003. At the time, the English Wikipedia was a giant blank page. It wasn’t hard to find a new article to create. The city of Durban? The Springbok rugby team? Kaizer Chiefs? Lawrence Ferlinghetti? Walter Sisulu? The Pan-Africanist Congress? I created the articles for all of these and more, and many articles were in a far worse state than Bobby’s once I submitted them. References? Pfft, too much trouble, who needs them. Today, the English Wikipedia is a very different beast, the criteria are far more stringent, and it’s no longer possible to find such low-hanging fruit to create. 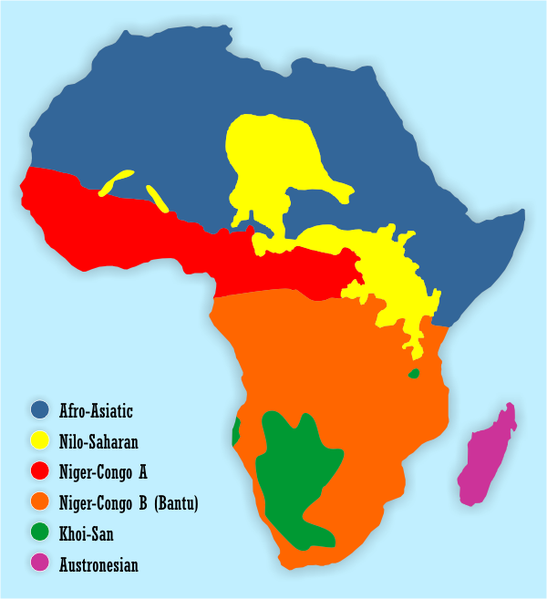 But Wikipedia still severely under-represents African content. Because I happened to spot, Bobby’s article I could remove it from consideration for speedy deletion. But shortly after it was nominated for deletion, which involves more energy spent justifying an article’s existence. If I had faced the obstacles new editors face today, if my new articles were continually rejected, deemed unworthy, and I had to spend all my energy in fighting to keep them, I can safely say I wouldn’t still be editing 13 years later. Let’s go back to David Tlale. Let’s imagine he was an American fashion designer. He’s had articles published about him in the New York Times and the Washington Post. His work has appeared at the New Fashion Week and the Paris Fashion Week. Would his article be seen as the equivalent of one about my pet rabbit? Systemic bias doesn’t imply that administrators nominating African content for deletion are malicious, out to sabotage the project. No, I’m sure they are well meaning, and having to deal with a constant stream of rubbish contributions must test one’s patience, so when they see another article about someone they don’t recognise, when because of their background they can’t quickly tell the difference between references from South Africa’s largest media companies and various personal blogs, the outcome is not too surprising. Since I’ve been editing for so long, I’ve been granted the “autopatrolled” right. This means any new article I create is listed as “reviewed”, and is far less likely to attract the attention of a trigger-happy administrator editor looking to delete it. At today’s Wikimedia South Africa board meeting, I proposed that we identify various experienced, trusted editors, and nominate them to receive the autopatrolled right. Most editors don’t know it exists, or don’t want to go through the red tape of applying and justifying themselves. This won’t help new editors, but it will help retain experienced editors who’re consistently beaten down by the opposition they face. My feeds have been full with Dumi editing up a storm on the Xitstonga Wikipedia recently, as well as helping the Ndebele Wikipedia into the incubator. Ndebele is the only South African official language without a Wikipedia, and it’s great to see this hole being plugged. So, it’s time for another African language Wikipedia update. The usual disclaimer that this only takes into account number of articles, an imperfect metric, as not all articles are equal. This article is in a far healthier state than this one, for example. Afrikaans as always continues to show steady growth, and while at times growth in other languages has spiked for a short while, Afrikaans has shown steady, consistent progress, and most of its articles are high quality as well. Swahili too shows steady growth, and has passed Yoruba, which was the beneficiary of a brief spike. Most dramatic has been been Northern Sotho, which is the most recent official language of South Africa to get a Wikipedia, and which only recently broke the 1000 article barrier. It has now surged past seven other languages, with 2830 articles. Much of this growth (a whopping 1544 new articles) is down to User:Aliwal2012, a hospital pharmacist living in Lady Grey who’s also extremely active on the Afrikaans Wikipedia, and modestly contributes to the English Wikipedia as well. Modest is a relative term, since in spite of being around for about decade less than me, and English only being their third most active language, they’ve still created more new articles in English than I have! A great example of the impact one person can have, made more visible by it being in a language that has little content. 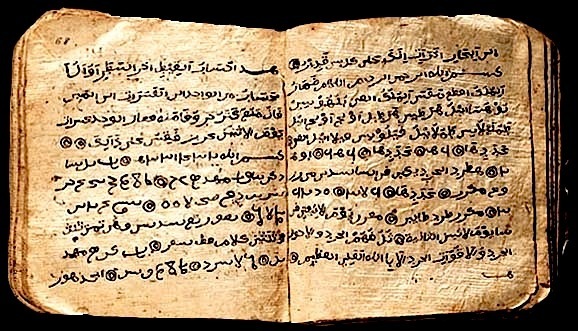 Kabyle, a language spoken mostly in northern Algeria, as well as France, has also shown some growth, passing Shona. Kongo, spoken in the DRC, Republic of Congo and Angola, has now also broken 1000 articles and is a new edition on the list, and Kikuyu is knocking on the door as well. Exciting to see new languages and bursts of activity, with only a few being relatively stagnant. The results here are particularly pleasing, as with the exception of Swati, all the languages are showing activity. As Northern Sotho and Xitsonga, have shown, one person can make a substantial impact. Anecdotally, some of the of this activity may be down to the content translation tool – it’s great to see a useful tool put to use by the community. This has probably been the most optimistic report since I started these a number of years ago. Long may it continue, as we get closer to a world where each human can freely share in the sum of all knowledge.